In Hinduism, Durga is a fierce form of the Hindu Goddess, Shakti. The name Durga means "the inaccessible" or "the invincible" in Sanskrit (an ancient Indian language). Durga is the consort of Lord Shiva. Durga is often depicted with many arms (from ten to a thousand) with many weapons, riding a lion, and battling or slaying demons, especially Mahishasura, the buffalo demon. Durga's victory over the buffalo demon is described in the scripture Devi Mahatmya. Durga's victory over the buffalo demon is celebrated in the festivals of Navaratri and Durga Puja. Durga Puja (also known as Dashain) is a four day festival celebrated in Northern India and Nepal. The day of Durga's victory is celebrated as Vijayadashami, Dashain, or Dussehra (Hindi) - which mean "the Victory Tenth [Day]" in various Indian languages. This figurine is made of polyresin, hand painted and polished. EXQUISITE CRAFTSMANSHIP - Premium sculpted resin with white marble finish - creates high-quality look without sacrificing the details. The Hindu Goddess Durga, an incarnation of Devi, is the mother of the universe and believed to be the power behind the work of creation, preservation, and destruction of the world. She represents a unified symbol of all divine forces. The lion represents power, will and determination. Mother Durga riding the lion symbolises her mastery over all these qualities. This suggests to the devotee that one has to possess all these qualities to get over the demon of ego. 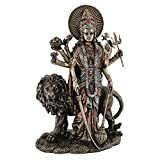 This stunning handcrafted representation of Durga comes in a cold cast bronze finish and measures at 11 inches tall. Durga, the mother of the universe, is regarded as the power behind the creation, preservation, and destruction of the world. She stands in front of the lion that represents power, will and determination, which symbolizes her mastery over those qualities. The special production process of this piece, originated from Great Britain, uses actual bronze powder mixed in the cold cast resin in order to ensure a richer, more life-like presentation. 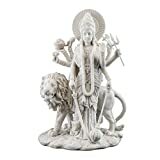 This gorgeous 8.5 Inch Durga Mythological Indian Hindu Goddess Statue Figurine has the finest details and highest quality you will find anywhere! 8.5 Inch Durga Mythological Indian Hindu Goddess Statue Figurine is truly remarkable. 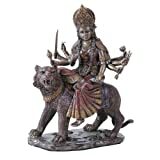 This Goddess Durga Riding On Tiger figurine is 8.5" tall, 6.25" long and 3.75" wide. 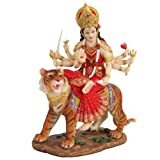 This item depicts Goddess Durga wearing a red sari riding on tiger. A tiger symbolizes unlimited power. Durga riding a tiger indicates that She possesses unlimited power and uses it to protect virtue and destroy evil. Goddess Durga (Hindustani pronunciation: [ˈd̪uːrɡaː]; Sanskrit: दुर्गा), meaning "the inaccessible" or "the invincible"; durga) is the most popular incarnation of Devi and one of the main forms of the Goddess Shakti in the Hindu pantheon. Ramprasad Chanda writes the following about the evolution of Durga from primitive goddess to her current form. "...it is possible to distinguish two different strata - one primitive and the other advanced. The primitive form of Durga is the result of syncretism of a mountain-goddess worshiped by the dwellers of the Himalaya and the Vindhyas, a goddess worshiped by the nomadic Abhira shepherd, the vegetation spirit conceived as a female, and a war-goddess. As her votaries advanced in civilisation the primitive war-goddess was transformed into the personification of the all-destroying time (Kali), the vegetation spirit into the primordial energy (Adya Sakti) and the saviouress from "samsara" (cycle of rebirths) , and gradually brought into line with the Brahmanic mythology and philosophy." Durga, a beautiful warrior seated upon a tiger, was the first appearance of the great goddess Devi. She is in the mood of a warrior, sent to defeat the demon Mahishasura. This Kali Statue Standing On Shiva is 8.75" tall, 5.5" long and 4" wide. This statue depicts the Hindu Goddess Kali standing on top of her husband Shiva. Kali has just gone on a cosmic rampage killing demons, and has become drunk on their blood. To placate her, Lord Shiva has thrown himself at Kali's feet, so that she would awaken from her drunken blood fest.